Photo of the gonfalone at <www.sulpm.info>. I believe that the Ducal standart in blue with white crowned eagle. Pictured in Vexilla Italica is another version of this flag. Modena first existence under Este dinasty was from 1288 and until 1797, and it existed again after a french rule between 1814 and 1829. The flag was blue with white eagle, and crown above the eagle head. Here is the same flag without crown as the maritime ensign. In old plates you can see the crown but with less detail. New flag was adopted 1830. Red-white-red horizontal and in center blue-white-blue vertical. Arms added in national flag and no added in mercantile ensing. This is probably for an historian. 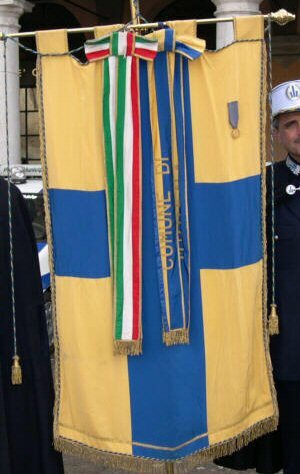 The flag on Modena (Italy): red/white/red horizontal with blue/white/blue vertical and centered over the r/w/r stripes. I know it flew during 1848 with a short two or three month interlude when the Green/white/red tricolor intervened. but when was it first raised, and when was it finally superseded? The flag was adopted in 1830 and superseded in 1859. The State flag had the arms in the middle. Modena State flag : red-white-red horizontal crossed blue-white-blue vertical, with shield. Adopted in 1830 and used until 1859. This was the State and war flag. The civil ensign was the same without the arms. New flag was adopted 1830. Red-white-red horizontal and in center blue-white-blue vertical. Arms added in national flag and no added in mercantile ensing.